Now that they’re both finally here, how will you choose? Will it be the Hyundai Palisade or its equally fresh corporate cousin the all-new 2020 Kia Telluride? Bigger than the departed Borego and their current best-selling Sorento, the Telluride is the largest Kia ever with seating for up to 8. I have loved the look of this one ever since it was unveiled in concept form a few years ago and though it’s not quite as formidable looking as it was; the Telluride still makes a bold presence with a profile that’s not too dissimilar from a Range Rover Velar. Families on the go will appreciate its spacious cabin that designers promise offers generous hip, shoulder, leg and head room in all 3 rows in what the company says is more luxe living room than utility vehicle. 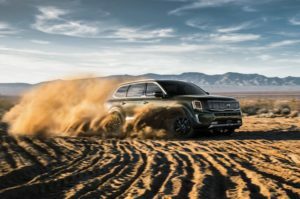 As the brand’s flagship SUV, the Telluride can be specified with the full array of Kia Drive Wise systems including the semi-autonomous Highway Driving Assist which controls steering, acceleration and braking while also recognizing speed limits on federal highways, adjusting accordingly. And when the kids are sound asleep in the back, mom and dad can continue to enjoy the 630-watt Harman/Kardon audio system by activating Quiet Mode that leaves the music playing for just them. The mechanicals are as follows: a fuel saving Atkinson Cycle 3.8-liter V6 produces 291 horsepower and 262 pound-feet of torque, mated to an 8-speed automatic transmission, riding atop a fully independent suspension with self-leveling in the rear to manage vehicle load and ride height. Front- and all-wheel drive models are offered with 4 distinct drive modes in addition to Snow and AWD Lock settings when conditions necessitate. Standard towing is rated at 5,000 pounds. Available in 4 trim levels, the Georgia-assembled Telluride will go on sale later this year with pricing announced closer to launch.